When every culture has their version of a stuffed dough pocket, you know they’re on to something. 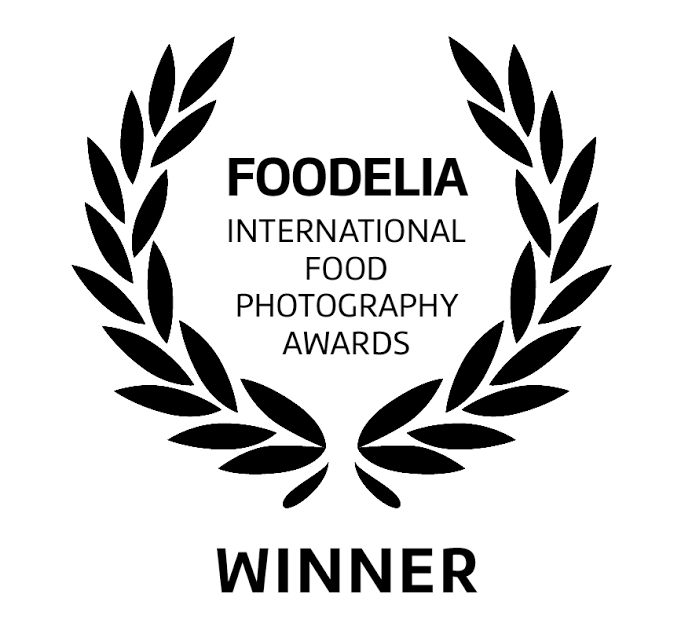 The Italians have ravioli, Spanish empenadas, Polish perogies and the list goes on and on. Of course, I am most familiar with Chinese dumplings and those varieties are my favorite. Of all the dumplings in Chinese cuisine, the most well known are the jiǎozi. I’ve also got a cool trick that makes the wrapping process efficient and mess-free; it will blow your mind! Let’s take a look at what we need for Pork, Chive & Cabbage Dumplings. They’re pretty simple. Meat, veggies, and some aromatics get mixed vigorously together with your choice of seasonings and then you slap a spoonful in the middle of a dumpling skin and pinch it closed. They’re also a great way to hide veggies in a meal so I like to use a 1:1 ratio of meat to veggies. You can decrease the ratio of veggies easily, but if you plan on adding in more veggies, use an extra egg or two to help it bind together. 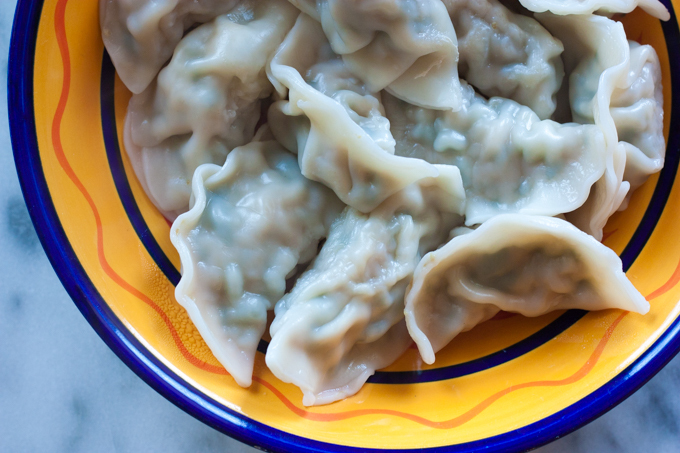 If you don’t have that raw protein in the mix, the filling will hard to work with when wrapping and worse, fall apart when you bite into the dumplings! I used Chinese chives and white cabbage with ground pork that was half lean and half fat. Don’t be afraid of the pork fat; you need it to keep the rest of the filling moist as it cooks. As far as fillings go, it’s really open ended. You can fill it with whatever you want, but the traditional Chinese filling of choice is always pork and paired with a vegetable or two. Some other ingredients you can consider: ground chicken, ground beef, finely diced up tofu, cooked eggs, green beans, long beans, napa cabbage, celery, shrimp, mushrooms, etcetera, really the possibilities are endless. Be careful of watery veggies, especially napa cabbage. You need to heavily salt and then squeeze out the excess water otherwise it’ll bog down your fillings and make it hard to work with. No matter what main components I choose for my dumplings, the aromatics stay consistent: green onions, including the green and the white, and tons of garlic and ginger. To season the filling, I use soy sauce, salt, rice wine and sesame oil. Crack in an egg and stir with a strong pair of chopsticks or spatula. My parents always say to only mix in one direction, so that’s what I do. Not sure if it works or not, but that’s what I’ve always done. 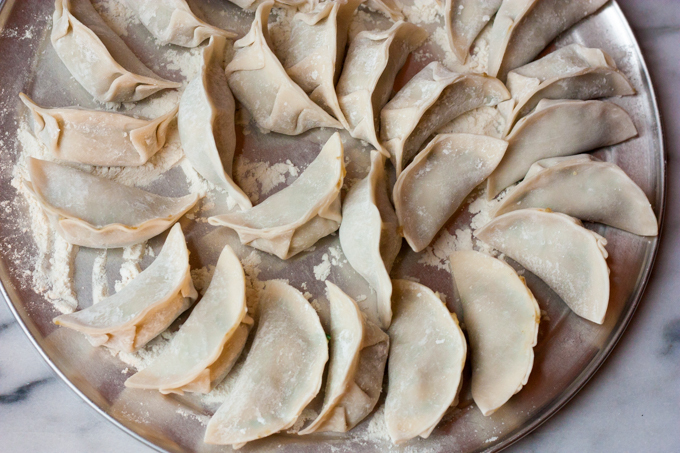 Now that your Pork, Chive & Cabbage filling is done, it’s time to choose the dumpling skins. Yes, you can make and then hand roll our each one, but I don’t have the time or patience for that. With so many Asian and international stores around, you’re bound to fine some in the frozen or refrigerated section. I like using the “Northern Style” skins beacuse they are thicker and easier to wrap with, especially if you are an inexperienced dumpling making. Nothing is more frustrating that constantly tearing dumplings skins. If you buy frozen skins, make sure to let them defrost in the fridge for a night before using them. You can microwave defrost them, but I don’t like taking the chance of accidentally microwave cooking the edges or melting them into a glob. Please note that while I don’t care what style of dumpling wrapper you use, I would not use the square skins. Those are actually meant for húntun, otherwise known as wontons. 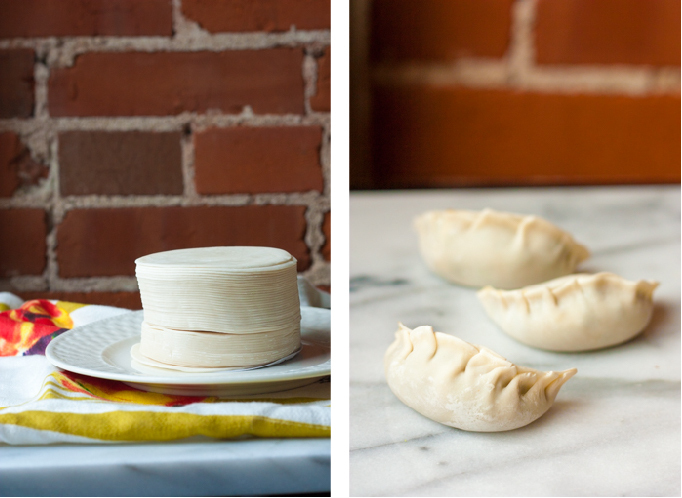 These soup dumplings are actually my favorite, but that’s a post for another day! Now, there are many different dumpling making methods and you can experiment with them, but there is no golden standard (at least not in my house) on how to fold them. If you want some basic tips, take a look at these three styles from Epicurious. I cringe when I see people just fold them in half, like a ravioli, but if this is your first attempt, it might be easiest to stick to that method. The picture below shows a couple of folding methods. The Pleat (starting at 2:36) is used in the top row and the left half of the middle row. This method is a pretty way to make dumplings and creates a good bottom, especially useful for pan frying or steaming. My least favorite, the Half Moon, is the easiest method but creates floppy and unappealing dumplings. You can see on the right half of the middle row how they lay flat on the tray without any visual interest. I prefer the Squeeze method where you use your thumbs and forefingers to seal eat side of the dumpling. This video is very pixelated, but hopefully you get the idea. This method allows for more filling to be wrapped securely inside the skin and also gives the dumpling a nice bottom (heh). This is probably the hardest method, so don’t worry if you don’t get it immediately. 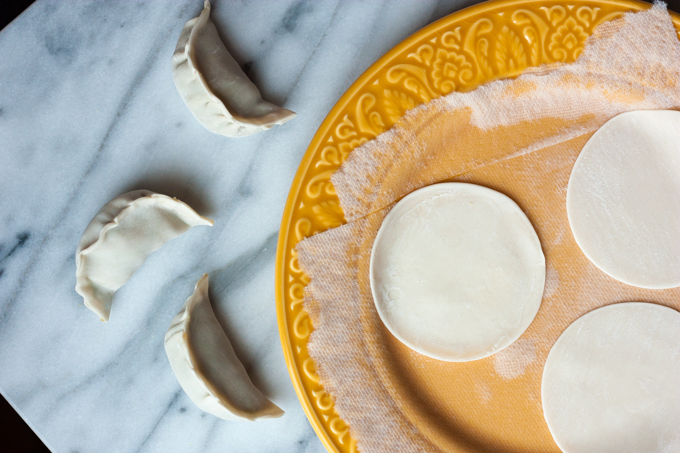 Everyone has their method of wrapping dumplings so it’s hard to say which method will work the best for you. I had 3 other people helping me wrap this batch of Pork, Chive & Cabbage Dumplings, and as you can see, the dumplings greatly vary in size and shape! The main goal is for the filling to stay inside the wrapper and not explode, so don’t worry if your first few aren’t picture perfect. Now for the trick. No matter how you choose to wrap your dumplings, do not fall for the “wet your finger to seal the edge of the dumpling” method that everyone does. This little step will make your dumpling wrapping process laborious and slower than it has to be. Not to mention the mess it makes when your wet fingers touch the dry skins and then everyones flour dusted fingers have to go back into the communal water cup. Ugh. If you’ve been wrapping dumplings like this, my secret will change you life. Put down a paper towel on a plate. Pour enough water on the plate so the towel is fairly damp. Then place the skins on the wet plate. I like to put 3-4 skins down at a time on a plate, depending on how large the wet surface is. Simply pick up a skin from the plate so the wet side is facing up, and voila! You’ve already wet the entire inside of the skin and all you have to do is fill and seal. No mess here. Eventually, you’ll have to rewet the paper towel as you constant put new skins on. Just make sure not to inundate the plate, otherwise your skins will be swimming and disintegrate when you try to seal them. 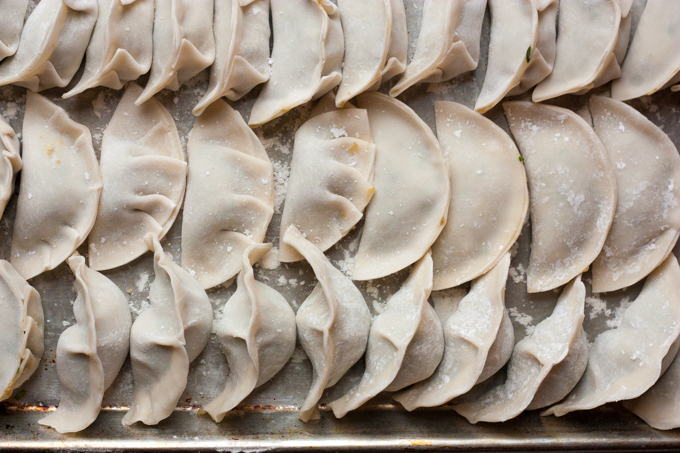 As you go along making dumplings, make sure you have plenty of floured sheet pans or trays ready to go. That way your dumplings will have somewhere to sit while you finish wrapping the rest. If you let them sit out in the air too long, the skins will dry out and crack, so be mindful and stash the trays that aren’t being immediately cooked in the fridge or freezer after you cover them in plastic wrap. Unfortunately, no matter what you do, you will either have left over filling or unused skins. It’s a known fact that only dumpling masters, such as grandparents, can correctly predict and make just enough. So I always err on the side of buying extra skins. They fare better in the freezer than the filling does. Once you defrost the filling, it tends to leach out a lot of liquid and break your mixture. 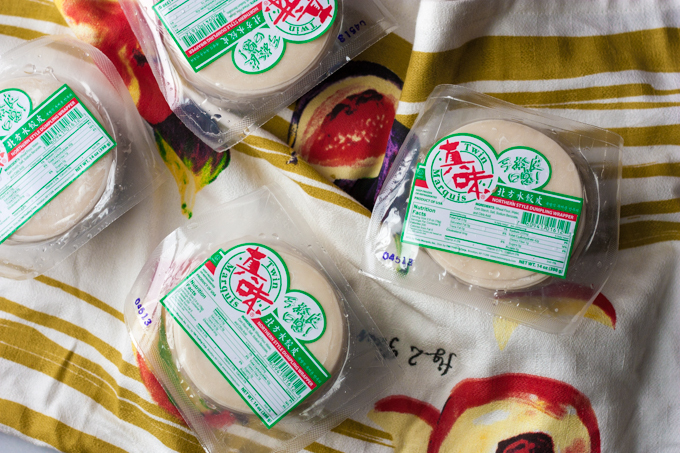 The number of dumpling skin packs will also depend on what style wrapper you choose. The thicker the skin, the fewer there are in a pack. I’ve only correctly estimated twice, but this batch came pretty close. 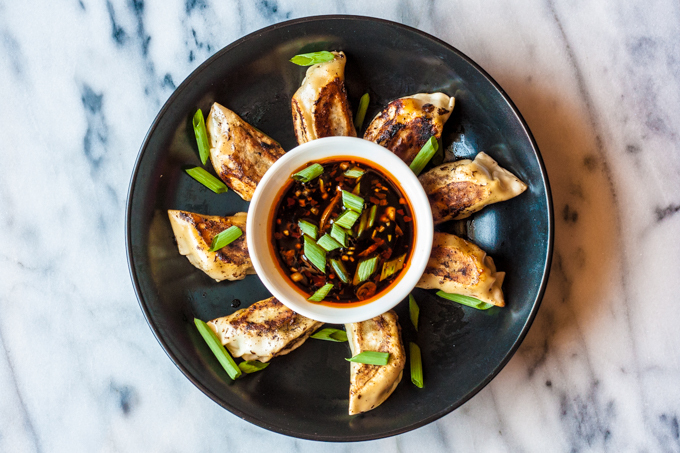 You have to have sauce for the finishing touch on our Pork, Chive & Cabbage Dumplings! Some people like the thicker and creamier peanut sauce, but I like to stick to a vinegar and soy based sauce. The amount of each component you use is up to your discretion, but I like a combination of soy sauce, black vinegar, sesame oil, chili paste, pickled garlic and green onions. The household favorite chili sauce is Laoganma, or “Old Godmother.” There are several varieties, but our favorite is the one with peanuts! You can find it for cheap at any asian store, so don’t think you have to buy it online. Pickled garlic is something that was always in the fridge when I was growing up. 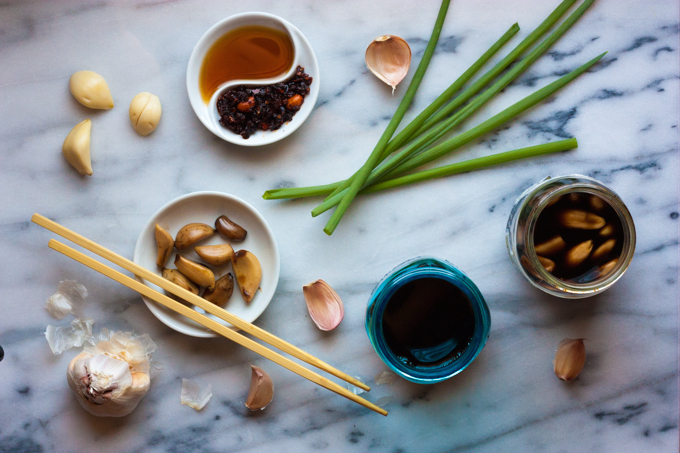 It’s simply a jar of peeled garlic cloves submerged in black Chinese vinegar. To make some at home, just peel and score the cloves, covering with just enough vinegar to fully submerge the garlic. I like to use a jar with a tight fitting lid as well as covering the inside with plastic wrap since this mixture is really pungent. When making the dumpling sauce, pick out your pickled garlic cloves and pour out some of that wonderfully garlicky vinegar. The garlic is more mellow and doesn’t have the harsh bite of raw cloves. Simply drop in some new garlic cloves and once again fill with vinegar to cover. This way, you always have a good supply of pickled garlic and garlic vinegar. From this point, you can mix up different sauces and see which ones are your favorites. Owen prefers a vinegar and chili heavy sauce, while I like a soy and garlic based one. It’s easy to tailor to each person. Just give each person his or her own sauce bowl and they can decide for themselves. Now for cooking methods. Dumplings can be boiled, steamed or pan fried, all resulting in very different textures. While the cooking method doesn’t affect their English names, there is a distinction in Chinese. If you boil them, they are 水餃 (shuǐjiǎo) or literally, “water dumpling.” Steamed dumplings are 蒸餃 (zhēngjiǎo), translating to “steam dumplings.” If you pan fry them, they are 鍋貼 (guōtiē), literally “pan stick” because they stick to the pan during the cooking process. Now you see why they are called potstickers! I prefer the guōtiē because I love the crunchiness and golden brown exteriors, but Owen is a fan of the boiled ones. They are all delicious and can be made from fresh or frozen dumplings. 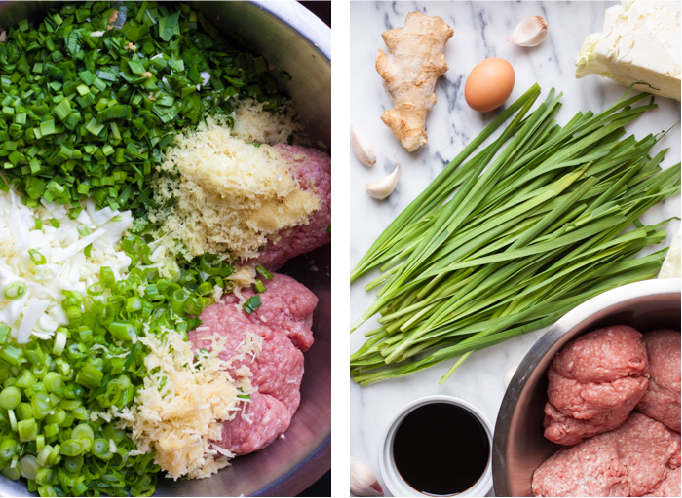 No matter which method you choose, your Pork, Chive & Cabbage Dumplings will be delicious! For boiled dumplings, bring a large pot of unsalted water to a boil and carefully drop in the dumplings. be careful not to crowd the pot. Cover and let it come back to a boil. Once it comes back to a boil, pour in a cup of cold water. Repeat the process 2 times. Dumplings will float to the top and turn slightly translucent. If you want to pan fry them, it takes a little more finesse and self control. Pour oil into a hot pan (I like using cast iron or all-clad) and place dumplings with their flattest side down. Pour enough water into the pan so there is about a centimeter of standing water and cover immediately. We are essentially steaming the dumpling to cook it through and then the remaining oil in the pan will crisp the outside. Once you see that the water has cooked off, you can uncover the pan and test if the dumplings are ready to be flipped. You need to be patient! If the dumpling is stuck to the pan, it isn’t ready yet. It will release itself when it’s done. Don’t poke or prod them while they’re in the pan, got it? You don’t want to damage the skins and let all the meaty juice out. Once the dumplings easily come off the pan, you can turn them to crisp up the other sides. Using a flat metal spatula will help if the dumplings need to be coaxed off the pan. But if you are using a nonstick pan, forgo the metal! You don’t want to scratch off the coating. If you have leftover dumplings like we always do, I would suggest not cooking them until you are ready to eat. They are easy to freeze and taste better when freshly cooked. 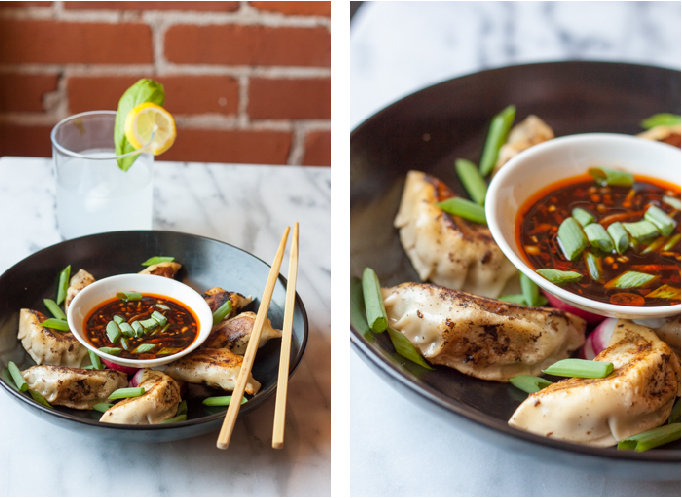 We tend to make a ton of dumplings at a time and always make extra just to have for later. We like to freeze them on lightly floured baking sheets. Once they freeze through, you can pile them into a large Ziploc and store them in the freezer for quick meals. 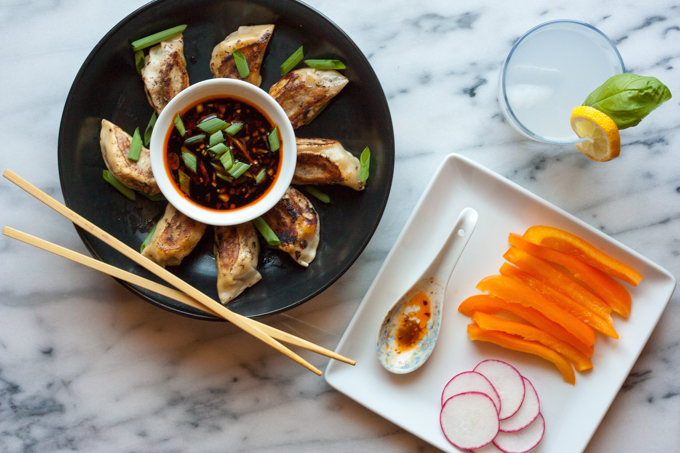 We love having frozen homemade dumplings stashed away for quick meals and I know you will too! If you have any other folding techniques or dumpling tricks, let me know. 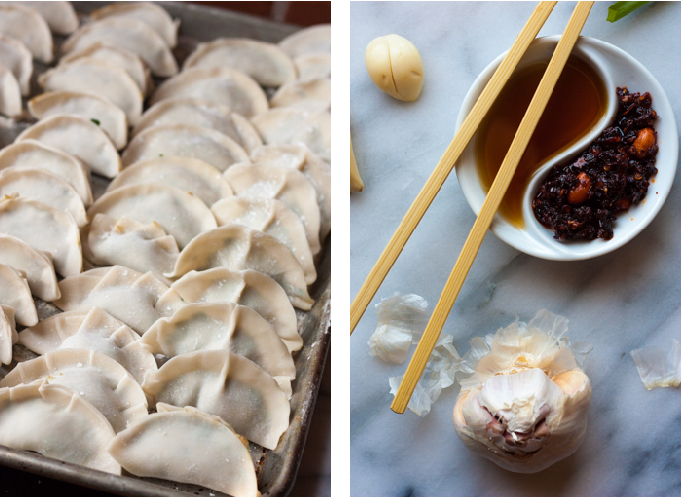 I am always on the lookout for ways to make dumplings faster and easier! 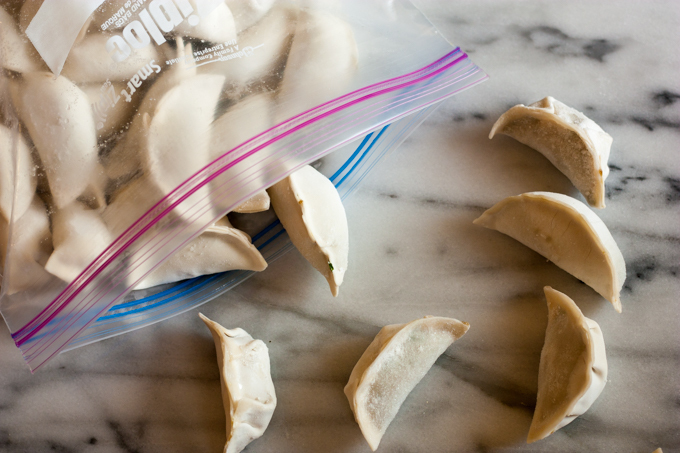 Remove dumpling skins from refrigerator. If skins are frozen, leave in the fridge overnight or microwave to quickly defrost. Chop veggies. If you are using watery veggies, salt them after chopping to strain out the excess liquid. Combine chopped veggies, ground pork, egg and seasonings. Stir in one direction until the mixture has come together and the ingredients are evenly distributed. Taste test your filling by frying up a small piece in a pan. Adjust seasonings accordingly. Place a paper towel on a plate. Wet the paper towel just enough so it is damp. Use this to wet your dumpling skins as your wrap them. (The idea is to put a new one on the damp paper every time you pick up a wet one to wrap.) Lightly flour sheet pans. Set the bowl of filling, dumpling skins, wet plate, and sheet pans up in a way that it is all within arms reach and easily accessible to everyone who is wrapping. Pick up a damp dumpling skin, dry side down, laying it in the palm of your non-dominant hand. Place a large tablespoon of filling in the center of the skin. Fold closed so no filling will seep out. You can do the simplest Half Moon method where the dumpling lies flat on one side or try a more advanced pleating or squeezing technique where the dumpling sits up on its bottom. Place on floured baking sheet. Repeat until the filling or the skins run out. Carefully drop in the dumplings, being careful not to crowd the pot. Cover and let it come back to a boil. Once it comes back to a boil, pour in a cup of cold water. Repeat the process 2 times. Dumplings will float to the top and turn slightly translucent. Bring a pot of water to a boil and place a paper towel in the steamer basket. The paper towel will help ensure that the delicate skins don't get stuck to the steamer basket. Place dumplings in the basket once the water comes to a boil and steam with the lid on for 12-15 minutes. Pour oil into a hot pan and place dumplings with their flattest side down. Pour enough water into the pan so there is about a centimeter of standing water and cover immediately. Using a flat metal spatula, flip the dumplings to crisp the remaining sides. Finely chop pickled garlic and green onion. Mix with soy sauce, vinegar, sesame oil, and chili paste. I tried it today and found that when I use Chives, keeping the weight ratio of 1:1 for meat to vegetables end up looking as though there’s too much chives and too little meat to bind it together. I added a little more meat to balance it out. Overall I used the seasoning as suggested and test fried the filling as suggested too. Think that’s a great tip. I also like the tip on setting up the wrapping station. It’s great for a first timer like me.